How many drops of rain need to fall for it to be raining? Seriously. What’s the difference between drizzling, sprinkling, showers and actually RAINING? Is there a number? A rate of drops hitting the ground in a given period of time? What exactly IS the scientific definition of “raining” and does that differ from the common usage of the word where any one of us can look out the window while talking to someone on the phone who’s far away and tell them with assurance that it is in fact raining outside? Similarly, in rock ‘n’ roll how many women artists need to be credited for it to be a non-issue when another one appears on the landscape? Whatever that number is we clearly haven’t gotten there yet, not by a long shot, and so the appearance of Devonia Williams these last two reviews is reason enough to take stock of the situation. Rock history encompasses many ancillary things beyond just the sounds found in the grooves of whatever records hit the street and reach your ears. All of these peripheral narratives contribute to the larger story. There’s the success of the smaller independent companies which marketed this music as an alternative to the mainstream pop they either were largely excluded from pursuing thanks to the dominance in that field by a handful of major companies, or because they saw a smaller, yet fertile market waiting to be catered to with little competition for that right, and so they pounced on it. In the process they changed not only the record business and musical landscape, but also in time society as a whole which gradually became more inclusive with a broader scope thanks – in some small way – to the exposure of this music. Likewise there’s the background of the culture from which rock emerged, at once both marginalized and discriminated against, yet brashly optimistic and possessing an infectious spirit which when bottled up and released through this music was powerful enough, enticing enough, to pull in even those outside of its sphere in time, thereby giving the community increased power and influence in succeeding generations. All of that has already been seen – and will be seen in far greater ways as time goes on, right up to the present when rock music has done more to empower those on the fringes of society than virtually any other widespread creative endeavor. But what of the women? The (roughly) fifty percent of the populace who also were discriminated against, marginalized, and told by the male dominated society that their input wasn’t needed or wasn’t welcome. Why haven’t THEY made the same strides in this music? I know it’s repetitive to keep asking, but I’m asking because there isn’t a logical explanation that I can see. Women in other forms of music, pop, jazz and gospel particularly which covers a very wide swath of culture, were exceedingly popular, not just in terms of the biggest stars in those fields but also in terms of the sheer number of performers plying their trades in those realms. So this lack of comparable representation in rock seems to be an anomaly, an inexplicable quirk that has no sensible reason at all. Yet it not only adversely affected the landscape of the late 1940’s rock scene but it would persist more or less for another decade as female rock artists were few and far between until the dawn of the 1960’s, even though those who did make their presence known often wound up as legitimate superstars. Since what we’re doing here is studying rock history as a whole to see how and why it progressed as it did this lack of women in the field becomes a dominant (if redundant) theme as we go along. We don’t want to keep harping on it ad infinitum but we need to bring it up when it’s relevant which means the rare appearance of artists with two X chromosomes is going to pose the question again… how is this one-sidedness possible? Unfortunately there are no answers for that, not in this review for sure, maybe not even by the time we reach the reviews for 2017’s rock releases, though at least by then Rihanna alone will offset the male dominated hit parade. So instead it’s left to studying each record BY a female artist that comes along, still relatively few and far between at this point in 1949, to attempt to discern where they were falling short… Was it merely opportunity? Lack of creative control over their own output? Trouble connecting to an audience, maybe one that was uncomfortable with ladies wading into the rough and tumble environs rock made its bones in and thus were less than receptive when one tried to come aboard? Record by record some trend has to become apparent, or else it’s going to boil down to either a deep seated institutionalized prejudice shared by record execs, musicians, dee-jays and listeners, which eventually means you and me… or it’ll be just one amazing coincidence, a fluke of monumental proportions. Devonia Williams wasn’t going to be the one to turn the tide, not single-handedly, nor even as part of a growing movement. She was, to be perfectly honest, merely a tangential figure, albeit a very talented and welcome one on the rock scene for a number of years, yet this will be one of her few featured performances. The lack of more opportunities (presumably) had less to do with her skills and potential ability to crank out interesting and appealing work on her own, and more to do with her day job, which was as a vital cog in the huge Johnny Otis congregation of fellow musical vagabonds. Williams was born in 1924 and while I cringe saying this, she appeared much older than her mid-20’s when this was cut and the handful of available photographs of her were taken. I suppose the reason for this is because she possessed a sharp, sleek appearance, an angular face and slender body, glasses (sunglasses in many of the pictures) giving her a schoolmarm façade, yet let it also be said that despite this she possessed a veil of exotic danger. Pardon the comparison but in some less flattering photos (not the ones on our pages which show her in a better light) she’s appears to be almost like a black Margaret Hamilton, a/k/a The Wicked Witch of The West in The Wizard Of Oz, who since SHE was green makes the connection a few degrees further apart than normal. Maybe that’s it though, in a unsettling roundabout way. When we talk about men’s place in rock history we hardly mention looks unless they’re someone whose physical appeal was SO overwhelming – Elvis Presley, Marvin Gaye – or so grotesque that it can’t helped but be mentioned. To date here on Spontaneous Lunacy I can remember just three instances where a male vocalist’s physical appearance was brought up at all, Wynonie Harris, Andrew Tibbs and Sonny Til. Everybody else, well over 60 names, more if you count every group member and sideman, you’d have no idea what they looked like unless we showed you a picture. But the women are different. 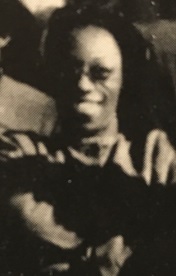 Without even realizing it I’ve made mention of Annie Laurie, Big Maybelle, Chubby Newsom (PLENTY about the gorgeous Chubby) and now Devonia Williams and how they looked, in some cases before even mentioning their musical traits. Okay, so it makes me an unwitting sexist pig, or a typical male if you are inclined to be more generous and forgiving than I’d be if the situation was reversed, but the thing is, I don’t believe I’m alone in this. I DO think that women are evaluated by men on their looks first, their abilities second, and perhaps with a music that was as often crude and suggestive and in an era where there WERE no articles, posters and internet videos to use their visual appeal to spread their musical wares, that was a detriment. I don’t know, I go back and forth on this question, but it HAS to be something, because when taken at face value (no pun intended) on strictly their musical worth, the ladies are certainly holding their own with the boys, as Dee’s Boogie makes perfectly clear. It’s another instrumental, which of course means that the gender of the band leader is even less apparent upon listening than it would be for a vocal performance, but regardless of the chromosomes belonging to the hands whose fingers play the keys, it’s certainly a credible job, but as even the title shows it was also rather predictable. Williams was highly skilled, conversant in pounding boogies and more intricate flourishes, and though we’ve had only a few piano players to compare her with (Forest Sykes, Amos Milburn, Sonny Thompson, Paul Gayten, Todd Rhodes… down to TJ Fowler and Milt Buckner in the background for others) Williams has every right to be held aloft in their company, not just based on what she shows here, but in Otis’s group behind a plethora of others through the years. 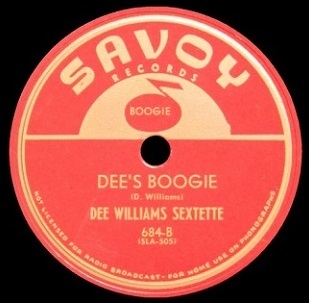 Despite its name heralding her role within, Dee’s Boogie is more of an ensemble piece where each faction shares the load and contributes to the overall sound. No one instrument stands out, though the horns increasingly get featured as it goes along as was prudent for the era in which sax led romps were tearing up the charts. They’re the brightest spot on this as well, the ensuing solos after the midway point heating things up considerably and making this a perfect backdrop for the larger rock scene in the winter of 1949. But maybe that’s part of its problem as well. Because none of the parts stand out much on their own (tellingly, Williams doesn’t get a bigger share of the spotlight to strut her stuff) it doesn’t grab your attention in quite the same way as some other instrumentals do, the ones which are built around a showy lead or else a sinewy groove held down by all involved. 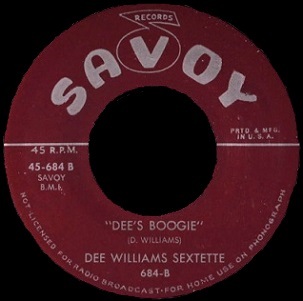 Dee’s Boogie sort of sits halfway between those ideals, trying to keep it locked in an appropriate groove, yet allowing the horns to break away for stand-alone glory, it doesn’t quite connect on either one, though it never fails to keep your attention, nor does it fall short in maintaining its appeal. Yet there’s a slight disconnect here all the same, one born out of the structural flaws (maybe too strong an implication, call it structural deficiencies, a somewhat more polite word that means the same thing). It’s as if each individual component necessary for a strong instrumental has been included, and played well besides, yet were thrown in without much forethought. It’s got a disjointed air about it, even though it never clashes or feels out of sorts, but rather there’s a bit of a everything but the kitchen sink mentality to how it was constructed that makes it more of a pastiche of the style than a leading exponent of same. The intro which has a wonderful effect of ramping up its power, like a powerful car engine turning over in the morning, quickly gives way to a churning horn section that carries it forward without much aim as Williams’s shows off her fleet fingered work behind it. That passage is the most intricate they get and you’d like it if that aspect was developed more, but it soon gives way to the horn solo which makes up the bulk of the record. As you’d expect it’s typically crude for the era, but it’s also melodically wandering. When the tenor trades off with the baritone it’s obvious neither of them has any clue where they’re headed. They stay within sight of one another, answering what the other is doing well enough to not lose you altogether, but its not until end of their shared jaunt that they finally are in lockstep with one another, which works quite well but comes awful late in the proceedings. Meanwhile Williams holds down the fort with her nimble work on the keys as it heads down the stretch, the drummer adding some timely and emphatic fills to keep it lively, but for all the mayhem they suggest there’s not really that much to get worked up about. The melody is serviceable, the riffs are competent, the playing is fine, but none of it is compelling enough when added together to make it more than just an average romp through the rock garden. Entirely welcome, but non-essential. But then again, plenty of what the men have dished out have been equally run of the mill. Yet all of it, from men and women alike, are adding to the overall spirit that is overtaking the wilderness as this sound spreads. Average is, as we keep saying, no insult, without the average records – the BULK of the output from everybody we’ve encountered, there’d be no rock landscape to explore, just a few far flung islands in the middle of an ocean of indifference. So Devonia Williams, welcome to that vast expanse of fields and prairies. While the spot of land you’re sitting on may not be noticeable on its own, its mere presence, like the presence of the handful of women who’ve made this journey to date, are vital when added together as pieces, however small, of a larger patchwork of sounds, figures and moments. 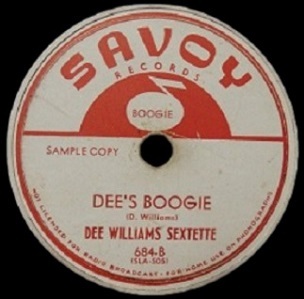 Leave a reply on "Dee Williams: “Dee’s Boogie”"